The above passage taken from a nineteenth-century novel indicates the various arenas of a discourse of fear of Roman Catholicism that underpinned much of the anti-Catholic writing of the time: the incarceration of men and women in religious houses, the ‘theft’ of property and money by Catholic priests and the power of the Roman clergy over English women and girls. 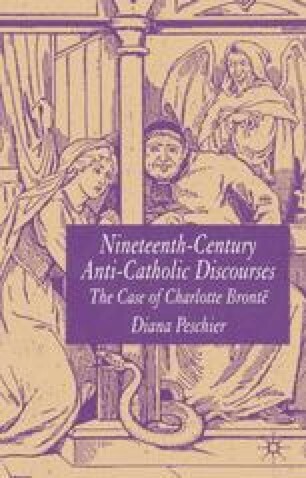 Much anti-Catholic writing of the time was specifically gendered and the authors of this particular genre of nineteenth-century literature not only employed current historical concerns in their work but also made use of contemporary interest in women’s mental health and masculine insecurity concerning their women. Priest: I trust the day is not far distant where there shall be no homes in England, but the men living in monasteries and the women in convents, and only priests at liberty. We shall then have all the broad lands of Britain for church property, and unbounded incomes to the priesthood, with power that no one shall question. As confessors to all the ladies, we shall visit them constantly, teaching them the necessity of never opening a Bible, the evils of marriage, and the whole code of Liguori [an influential Catholic theologian] who shows that the entire moral law may be set aside at the bidding of any priest and that with his sanction, theft, lying and all other crimes are commendable.